When it comes to you deciding to kick start your healthy lifestyle… step one right out of the gate is to change your thinking. 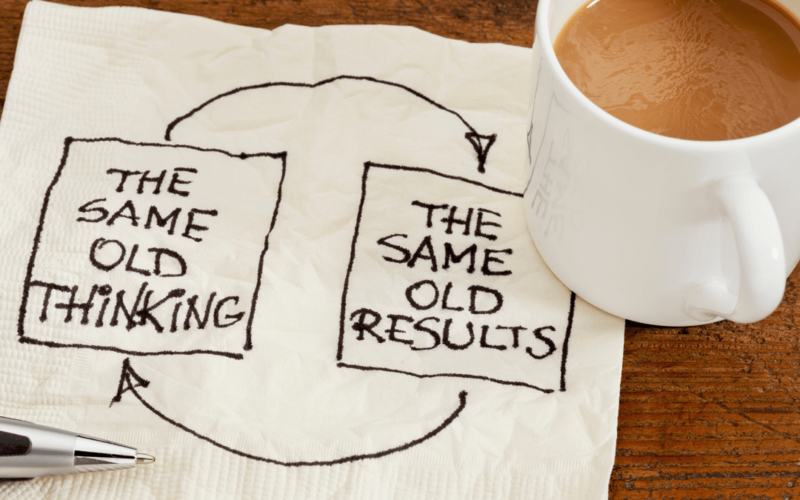 Just like that pic above says… same old thinking, same old results. So if you’re looking for a fast track to change your thinking and give yourself a swift kick to radically increasing your overall wellness, then a 3 day retreat could be your ticket! With all of us seeming to be far too busy with nowhere near enough time to get everything done, it’s extremely easy to get overwhelmed. Especially when it comes to maintaining your balanced sense of wellness. Between your job (or jobs), family, friends and everything else that pops up on a daily basis, how can you hope to keep up right? This is why choosing to set aside just one 3 day weekend for a wellness retreat is your answer. In a matter of only one weekend at a retreat like Happy Buddha, you could ramp up your wellness and overall health in all key areas. The reason a 3 day wellness retreat is so effective at helping you kick start your healthy lifestyle is that you get the best of all worlds in a short period of time. From nutrition, exercise, meditation and reconnecting with nature… it’s all at your fingertips. Plus what makes it so much easier for you is that you have an entire team of experts and staff around you… tending to your every need. Stop worrying about trying to figure out how to do that Yin yoga posture on your own… ask your teacher. You won’t have to sweat over your stove and be stressed over why your new organic vegetarian meal isn’t coming out right… you’ve got the best chefs serving you. When you attend your 3 day wellness retreat, it’s as simple as showing up… plug in and play! But of course, all great things come to an end, including your glorious wellness retreat. And as much as you will have gained in those 3 short but powerful days, what happens when you head for home? Once you arrive back inside your daily routine, how can you maintain your momentum of wellness and not losing out on being able to quickly kick start your healthy lifestyle? It simply comes down to using small pieces of your new puzzle. Don’t even attempt to do all things just as you did during your retreat. Instead dedicate just a small portion of your days to each aspect so you can keep stacking daily wins. Start your mornings with 5 minutes of meditations and 10 minutes of yoga. Drink more water than soda that day. And instead of hearing all the gossip over lunch, take a walk around the block or go soak in the sun under a lovely tree. Bit by bit, you’ll turn that kick start over a 3 day weekend into living your wellness based life on cruise control.